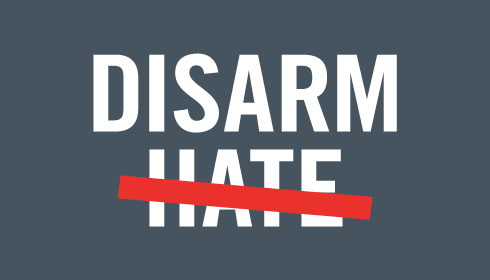 ADD YOUR NAME: Ask your legislators to support the Disarm Hate Act! When hate comes armed, it can be deadly. Last year it was an LGBTQ nightclub on Latin night in Orlando, a year before it was a historic African-American church in Charleston. We're partnering with organizations across the country for #DisarmHate Week, June 12th to 18th -- the week between Orlando and Charleston -- to honor those killed by hate-fueled gun violence and to demand action. Senator Bob Casey and Representative David Cicilline have introduced the Disarm Hate Act in Congress, which would prohibit people convicted of violent hate crimes from buying or possessing guns. Can you add your name and encourage your representatives to support it? We'll deliver your message directly in the coming weeks. Fill out your info to ask your lawmakers to support the Disarm Hate Act in Congress. Whether it's racism, homophobia, misogyny, transphobia, xenophobia, religious intolerance or any other bias -- we demand to live in a country where we can be safe to be who we are, believe what we want and love whomever we want. Please consider supporting the Disarm Hate Act to help keep guns out of dangerous hands and prevent hate crimes.